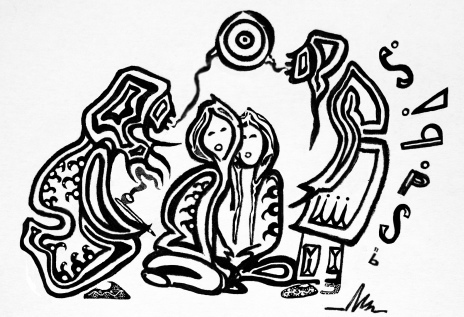 "Looking into the Healing Mirror"
Illustration: pen-and-ink protosketch of the digital painting "Wiinabozho and the Storytellers' Mirror" by Zhaawano Giizhik, 2012. "Sometimes the most painful lessons in life are delivered by someone masquarading as a soulmate." 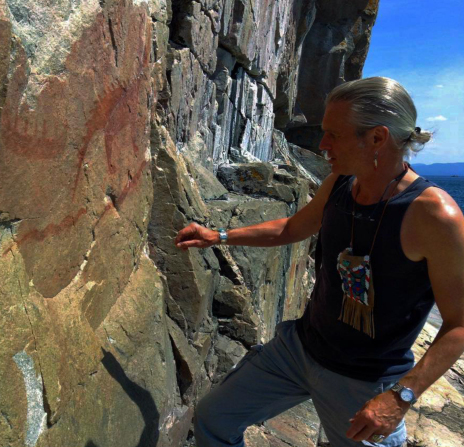 Welcome to part 1 of my brand new blog series titled Teachings from the Tree of Life, in which I connect the storytelling art of myself and kindred artists with an old Teaching that has been passed down to us by countless generations of ancestors from the time the Anishinaabe Peoples still lived in the old Dawn Land along the borders of the Atlantic Ocean. The story that I tell today features a pen-and-ink drawing, a protosketch of the painting Wiinabozho and the Storytellers' Mirror that I did in 2012. This painting marked the beginning of a life-long friendship and a fruitful artistic collaboration with painter artist Simone McLeod, originally from Pasqua Nation in Saskatchewan. Today's Teaching focuses on dealing with abusive relationships and broken friendships and the pain that comes of breached trust, a trauma that can forever change a person's life. In some relationships, hurting the other becomes a person's habit. It's poison, it kills. When one soulmate destroys the other because her/his inner child is broken it emotionally hollows out the one who is betrayed and left behind. The damage caused by the breakdown of the once intimate relationship is internal and goes deep; it goes to the very core of who we are. The betrayal literally kills the universe of the person who is being betrayed. It literally kills that person. The one who does the killing is only able to feel her/his own pain and moves on without feeling remorse about what she/he did to the other who had initially put all of his/her heart and trust and faith in her/him. I truly believe that a partner constantly finding fault in his/her soulmate and systematically projecting her/his negativity and narcissistic victim syndrome on the other destroys much more than just his/her heart. Traumas and syndromes cause more traumas and syndromes and it has serious Universal implications. The pain and the hurt caused by this type of relational abuse hurts our People at large and every living thing in nature and the harmful effects reverberate and leave scars troughout all of the Universe. We, as individuals as well as People, are in dire need of the healing mirrors our ancestors passed on to us trough storytelling and ceremony and our language, now more than ever. There is much to be learned from our Elders who are still among us and who survived many battles and storms in their own lives. We must be strong. **Excerpt from Brain Pickings. Philosopher Martha Nussbaum on Anger, Forgiveness, the Emotional Machinery of Trust, and the Only Fruitful Response to Betrayal in Intimate Relationships.